You’ve finally done it. You got the keys to a race car, and now you need it wrapped. Is it a NASA stock Miata? Have you joined the LS V8 swap brigade? Are you sitting behind the wheel of an R8? Maybe you’re a racing veteran with a team and professional sponsors. 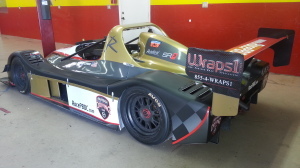 Here’s how Wraps1 creates custom race car wraps, as well as some ideas for your upcoming car wrap. Race Car Graphics: Go Big or Go Home? So you’ve decided you don’t want a sleeper. You want people to appreciate what’s under the hood (or the boot if you’re sitting in a Porsche, right? ), as well as the appearance of your race car. You’ll definitely want to go with race car graphics that speak to you, personally, and the type of driver you are during a race. Do you take risks and make decisions on the fly? Do you study every turn and know exactly when to push it? Choose a graphic that’s as flashy or serious as you are with a full race car wrap design. Cover that roaring metal beast from end to end in neon yellow or lime green, or pretend you’re Italian and go with Rosso Corsa (that’s racing red in Ferrari-speak). A new paint job can give a car a new lease on life, but what happens when you’re tired of the color, or you switch teams? Race car wraps are the ultimate option for any driver who feels like a chameleon behind the wheel. Maybe you’re after something subtle with a small set of race car decals on the side of your car. Perhaps a futuristic or minimalist carbon fiber wrap with custom designed decals that showcase your team’s logo. Maybe car wrap cost is no object to you, and you want graphics and decals covering every open space of your vehicle. Do you have legions of sponsors? Want to honor your fans? Looking to create a unique set of decals for a single race? 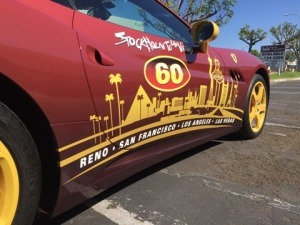 Make sure your creativity shows through with race car decals or a vinyl wrap that won’t peel, ripple, or stretch. Classic Race Car Wrap or Something Modern? Have you seen races from the 60s where most of the cars had nothing more than a large number on the side and one or two racing stripes? Remember NASCAR races from 1970s where you’d see wide stretches of color and a few decals scattered around the vehicle? Recreate that awesome vintage look today with a full custom car wrap or set of race car decals from Wraps1. 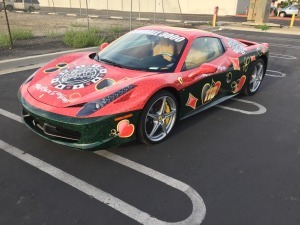 Or, make your car look like it just finished the Auto Club 400 in Fontana with decals so large they’re visible from space. Okay, maybe not from space, but you’ll get the point across! How Do We Design a Wrap for Race Cars? 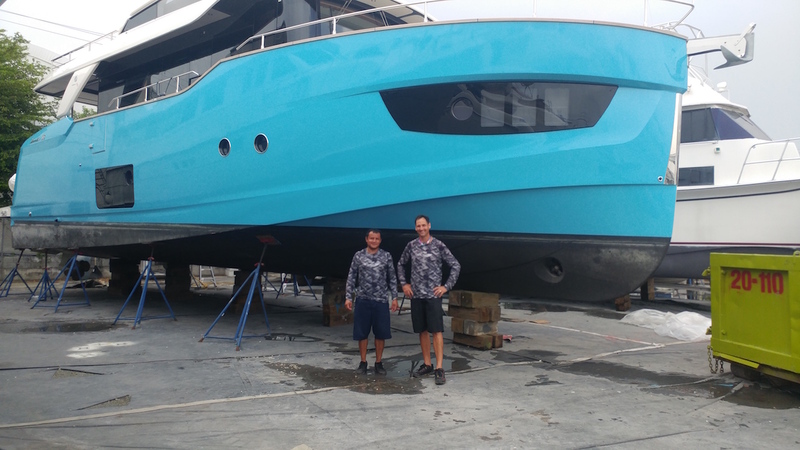 Wraps1 is a pioneer in the vinyl wrap industry, and we’re known for our ability to customize our customers’ cars with inspired designs and flawless results. After working on the graphics process with thousands of vehicle owners, we know exactly how to take your idea from the drawing board to the final wrap stage. The cool thing about working with us is that we have actual graphic designers who work on getting the size and shape of your wrap’s decals exactly right. We don’t just give you a selection of colors and finishes and ask you which color you want. Whether you have visions of Nürburgring, you’re headed to a parking lot for autocross, or you’re going to Willow for the weekend, do it with custom car wraps for your race car from Wraps1. Is your car a creation from your own garage? Are you part of a professional team? 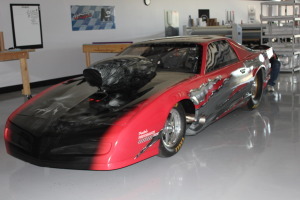 We do custom race car body wraps whether you’re just getting into the game with your very first engine swap or you’re a veteran driver behind the wheel with a professional team. We proudly offer our services to major cities across the United States, including in major cities like Miami, Dallas, and Huntington Beach.